The general settings are the settings that will be applied to your video files and projects by default. It is recommended to modify these settings before adding any videos to your project. These settings will be overwritten by setting made in the Tabs under the preview window. The settings changed in the Tabs under the preview window will only apply to the video file you have selected in the treeview. They will not be remembered for future conversions. To set your preferred settings for future conversions change those in the Default Settings that we will go over here and are accessible in the Top menu of ConvertX: Default Settings. The Working Folder is the location where your conversions will be saved. You can change this location and indicate an external hard drive for instance, by clicking on the "folder icon". Make sure to always provide a complete path file here. In the working folder, you will find a created folder with the same name as from the first added file, containing 2 sub-folders, named VIDEO_TS and AUDIO_TS. VIDEO_TS contains all "data" and AUDIO_TS is always empty and is required by some old DVD players to play. Note: If you have 2 (or more) hard discs in/at your PC, use one for the Source file(s) and the other to store the converted DVD files. This will optimize the read / write of the files. Note: Have in this directory (here E:) at least 4.3 Gb (DVD-5) or 8.5 GB (DVD-9) space free , so that the conversion can be stored here, before burning. The program checks before every conversion if this "reserved" space is available in case that the conversion would end up with a 100% (full) disc AND that the newly to be created "result" folder does not exist here (has same name as first added file). Note: Have in this directory (here E:) at least 25 GB BD 25 and 50 GB for BD 50 space free , so that the conversion can be stored here, before burning. The program checks before every conversion if this "reserved" space is available in case that the conversion would end up with a 100% (full) disc AND that the newly to be created "result" folder does not exist here (has same name as first added file). Remember last opened folder: If checked, the dialog for adding files will start from last opened folder, else from defined working folder. Display last tab used when navigating between titlesets: If checked will keep the last tab used open (under the preview window) when clicking on a new titleset in the treeview. Without this options checked editing tabs alwyas goes back to the tab "Preview" which is the equivalent of being closed. Check internet for updates regularly: Will check for version update periodically as long as ConvertX is running. Do not prompt for updates: If checked, ConvertX will not display any update availability message and you will not be warned if a new version is available. The Theme of the software interface can be customized with more than 26 colors to choose from. This will change the look and feel of the software applying different colors. The settings you'll select here will apply to the whole project (so all files within the same conversions) while the Chapters tab situated under the preview will apply only to the video selected. More options are also available in the Chapter Tab. Note: for ConvertXtoDVD only, A maximum of 99 chapters points can be created. This is limitation set by DVD standard not ConvertXtoDVD. 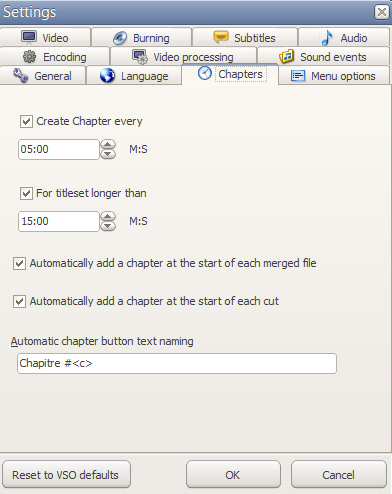 ConvertX automatically imports the original chapters that are on a video file. If original chapters are found, ConvertX will not apply its default chapter settings below, however if you go into the General settings and when you leave select "yes" for "Do you want to apply the new settings to the current project?" then the ConvertX chapters as defined in the general settings will be applied to your project replacing the original chapters. If unchecked, no chapters will be added automatically. This setting works in pair with For titleset longer than so make sure to read it below. A chapter point will always be created at start of file. You cannot delete this first one !! Inserts a chapter at the value indicated above only if the video is longer than the specified duration (default set value is 15 minutes). For example this means that no additional chapters will be added if you add a video that is only 10 minutes long, e.g. suitable for music video clips. Automatically add a chapter at the start of each merged file: if you merge files together a chapter point will be added at the beggining of every file merged for easier navigation. Automatically add a chapter at the start of each cut: a chapter point will be added at the markpoint of every cut for easier navigation. Here you find how the text will appear for the chapter buttons in the menu. Chapter # 1 : The text "Chapter" is modified in this section or in the Menus section, menu labels. The used variable can be changed as in the list shown. Change the variable between brackets < >. The brackets< and > are not shown in the final menu button. You can combine variables in a text line. Different menu templates come with the program, you can also get additional ones or create your own if you have some developing skills. Some guides have been made on the subject, for the links please see the section Menu templates on this post. You can select one the many templates in the drop down menu. All templates have their own characteristics and options. For a complete outlook on menu templates and customization, please check out this guide. The Edit current template fonts button opens a text editor which will allow you to edit the text appearance used for the menu template selected just above. Details in this forum post. You can decide what to do if the text label is too large (name of titleset, etc..) and won't fit on the menu screen: reduce text, crop it, ignore or cancel conversion. 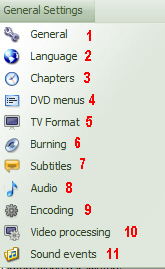 Click on Edit DVD labels if you want to change the name of the menu items: Settings, Subtitles, Audio, Play, etc. You can press F2 to make the fields under Default text editable or you can double click. Don't create title menu for single title: if there is one titleset only, the title menu will not be created. 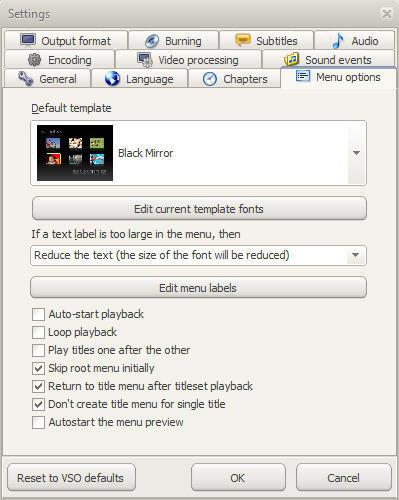 A title menu is usefull if many videos are converted as it is the menu that allows you to select which video to play. This title menu is not useful if just 1 video is being converted. Autostart the menu preview: useful when editing files in the treeview. If checked and if you click on a menu item in the treeview the menu will play in the preview window instead of having to first select the item in the treeview and then press the play button in the preview window. In this tab you can specify DVD format defaults that will be used. You will be able to customize video format options within each project individually in the Output Tab under the preview window. Make sure you select the right Format (Video Standard): PAL for Europe, NTSC for the USA (There is a possibility that you cannot play the DVD because of wrong Format, as not all DVD players/video playing equipment can rea/play both formats (PAL/NTSC). If you're not sure which format is used in your country you can check out this list. Automatic will use the format/frame rate closest to that of the first file in the project and apply it to the rest of the files. By default ConvertXtoDVD always outputs progressive playback file. If pulldown is used for the conversion however the playback will not be progressive. The DVD Resolution is the quality of the image. The different resolutions available (they are ranked according to quality, Full D1 being the best quality). The higher the quality, the more "heavier" your project will be. We recommend leaving these settings on "Automatic". Default is Full D1 resolution; you may however change this to a lower resolution to fit more videos onto one disc (will reduce image quality). 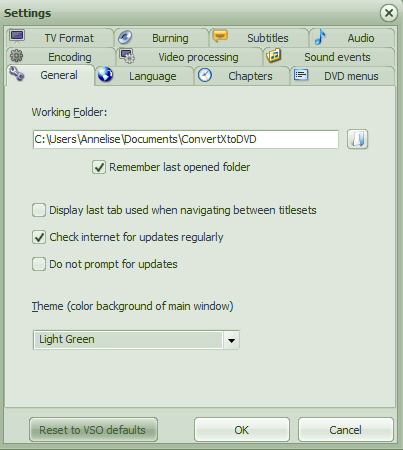 Select Automatic to let ConvertXtoDVD decide the resolution based on the resolution of the source file. The Aspect Ratio allows you to select whether you want the converted video file Aspect ratio to be set automatically or either be full screen (Aspect ratio 4:3) or widescreen format (Aspect ratio 16:9). We suggest leaving this on Automatic as Automatic will set the aspect ratio closest to that of the original videos. In the Output tab under the preview window you can see what aspect ratio was set per titleset/video added in your project. A project can have videos with different aspect ratios. In the Output tab you can change the aspect ratio which will override the Aspect ratio set in the general settings. Select Blu-ray or AVCHD depending on what is compatible with your player and also depending on what type of disks you want to burn your conversion to. Blu-ray structures can only be burnt on Blu-ray disks. AVCHDs can be burnt on Blu-ray, DVDs, or transferred to USB. Basically these structures are the same, the folders and files in the structure are not the same and perhaps not the codecs inside, but the way they play should be identical. Select the resolution you want for your conversion. 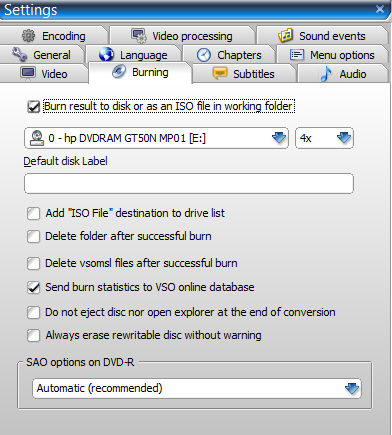 Burn result to disc/ as ISO file in working folder: If checked, program will burn folder files to disc after conversion has finished (when a blank disc has been placed in burner and this type can hold the amount of created "data"). If not checked, the files will be saved in the working folder on your computer. Also you can select between an ISO image or your default burner. You must set ISO image before you start add video file(s) in a new project. In the drop down menu, the burner detected is listed, if you have more than one they will be listed too and you can select the one of your choice. On the right you can also set your burning speed: Recommended speed for Single Layer (DVD-5) is 4x or 6x, but do not go faster than half of the rated speed of disc. For Dual Layer (DVD-9) we recommend 2x. Note: the burn speed that will actually be used is the burn speed that is available for both your drive and disk (each have their own allowed speeds). Example if you select to burn at 2x, but your disk only allows for 4x, 6x, and 8x the disk will not be burnt at 2x as requested but the closest speed to that which case it would be burnt at 4x speed. Default disc Label: Default text to be used for menu title and name of the disc. Leave empty to use the name of the first video file. Add "ISO File" destination to drive list: if you wish to be able to create an ISO file instead of burning to disk. Delete folder after successful burn: Once the burn is successful, the working folder will be deleted to save hard drive space. Source file(s) is/are not deleted. Note: If you want to burn multiple discs from this project, uncheck this option before you begin the conversion. Delete vsomsl files after successful burn: will delete the vsomsl files that are created when loaded into a VSO product. These vsomsl files allow the files to be loaded faster the next time (they will not be parsed again to create correct timestamps that were not in the original file. Send burn statistics to VSO online database: Will send burn statistics to VSO, requires an internet connection. The statistics are anonymous - no user or personal information is collected. Do not eject disc nor open explorer at the end of conversion: The disc will not be ejected NOR the folder or ISO file will not be opened in your explorer when the conversion is completed. Always erase rewritable disc without warning: Always erases an inserted rewritable disc without confirmation warning. 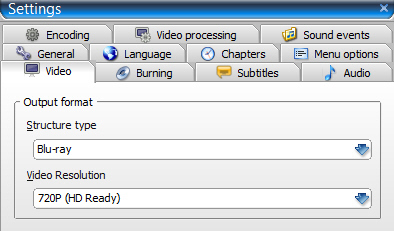 SAO options on DVD-R: Specifies the burn method for DVD-R media used by ConvertX. This should be left to Automatic, unless you have problems burning to DVD-R media. Possible choices are: force or prefer SAO or packet writing methods. Here you can define the default settings related to subtitles. To edit subtitles for per project and see a live rendering of your changes, go to the Subtitles tab under the preview. Default Subtitle language (identifier): This is the setting for the default language identifier which is assumed for all added subtitle files if they do not provide the information themselves on what language they are in. In otherwords if a language of a subtitle file is unknown ConvertX will identify it wiht the language set here (by default being "unspecified". When is the language identifier useful? A DVD/Blu-ray player will display this language abbreviation (identifier) when you select subtitles to play when using the 'subtitle' button on your remote control. Text subtitles rendering settings: This button opens up the Subtitle Style Editor, proposing advanced subtitle editing possibilities. Applies only to SRT subtitles. Other subtitles have their own formatting and cannot be modified in ConvertX. In this window basically change the settings to make the text appear as you would like. A preview window on the right will help you visualize your changes. Press OK when you are done and if you select "yes" to "Do you want to apply the new settings to the current project?" then those new settings will apply to any files you have added to ConvertX or they will be used in your next conversion. These changes you made will now be you default subtitle settings for all your future conversions. you make a conversion for them. Pick your preferred style in the editor (color, font, etc) then click on OK at the bottom to save it. 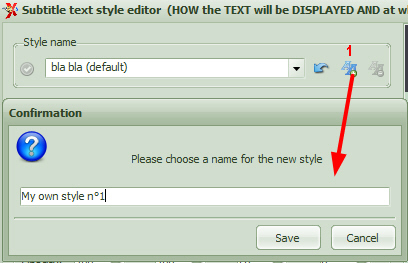 If you want this customization to be applied by default to all your projects, click on the green check mark icon on the left of the style name drop down selection (seen in image below). To delete a style you made, select it in the drop-down menu, then click on the Aa- icon. To reset the style to ConvertX default values, click on the arrow icon on the left of the drop-down menu. The icon of an arrow pointing to the left will restore default values for subtitle settings and apply that to the style selected in the drop down menu. On this tab you can specify audio defaults that will be used at start-up / for new projects. You will be able to customize these audio options within each project individually as well in the Audio Tab under the preview. This is the setting for the default language identifier which is assumed for all added audio files if they do not provide the information themselves on what language they are in. In other words if a language of a audio file is unknown ConvertXtoDVD will identify it with the language set here (by default being "unspecified". When is the language identifier useful? A player will display this language abbreviation (identifier) when you select audio to play when using the 'audio' button on your remote control. - MPEG: Converts audio source stream to MPEG format, with an output of 1 or 2 channels. If necessary it will be down mixed. Option not available in ConvertXtoHD. Note: To keep DTS (whatever) audio stream, select "Convert audio to format" to Automatic and uncheck "Convert DTS to AC-3" also you cannot use any audio level- normalisation. Not all players support DTS so if this option si unchecked, you might not be able to hear any sound. The audio normalizer analyzes the audio stream of the video and sets it at a normalized level to make sure the sound is perfectly audible throughout the video and videos of your project. By doing this you will no longer need to jump up and run to get your remote control to adjust the volume as you watch different videos on your DVD. Once you add a file to ConvertX if you click on the audio tab under the preview window and click to edit an audio stream your will see a magic wand button. Clicking on that button will normalize the audio stream based on the value displayed here. 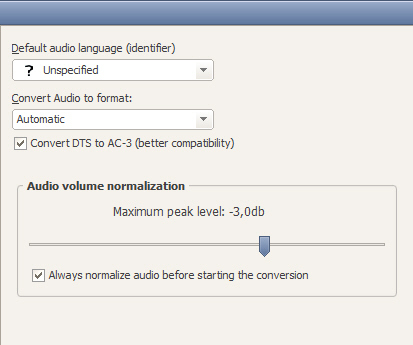 If you check the box to "always normalize audio before starting the conversion" it will do just that. Automatic setting: Use Automatic if you have no clue what the other options mean - even if you do have a clue it is the recommended setting for the best results. The program will decide for you what setting to use to achieve the best possible video quality. Manual settings: You can manually select one of the 3 encoding profiles should you want more control. This may not be the optimal setting if you forget to look at the total project length in the status bar of the main window. The project length is the Total time shown in the CX status bar as source files are being added to the project. SP (Short Projects): Use SP if your project has a total length up to 80 minutes. MP (Medium Projects): Use MP if your project has a total length up to 160 minutes. LP (Long Projects): Use LP if your project has a total length of 160 minutes or more. The Encoding option advisor will still advise you what setting to choose when the light turns yellow or red as it evaluates the total project length. Smart copy: will remux (copy without converting) the source video track if it is fully compatible. This saves conversion time. For it to be used the source tracks (video, audio or subtitle) must be fully compatible with selected output format. - The source must be a DVD Video STRUCTURE, that mean all mkv, avi, mp4... source files will not be remuxed. - The source must be a Blu-ray/AVCHD STRUCTURE, that mean all mkv, avi, mp4... source files will not be remuxed. You can choose your target size DVD-5 (Single Layer, 4.7 GB), DVD-9 (Double Layer, 8.5 GB), or a custom value (in MB). You can choose your target size BD-25 (23000MB), BD-50 (46000 mb), DVD-5 (Single Layer, 4.7 GB), DVD-9 (Double Layer, 8.5 GB) or a custom value (in MB). The program will make sure during conversion that the output file size is small enough to fit on the type of target size you selected. On average, about 4 hours of normal compressed video file can be converted and burned on to a DVD-5 without losing significant amount of quality. It depends on the source file if the DVD will be fully filled. Note: If you have unchecked the option [ ] Burn result to DVD, and used the target size DVD-9, you can check by looking in the log file if your conversion will even fit on a DVD-5 (cheaper) disc. A blank DVD even though the packaging says 4.7 GB only has around 4.3 GB of space available. The storage industry standard displays the capacity in decimal. Even though in binary you have more bytes, the decimal representation of a gigabyte shows greater capacity. In order to accurately understand the true capacity of the medium, you have to know which base unit of measure (binary or decimal) is being used to represent capacity. 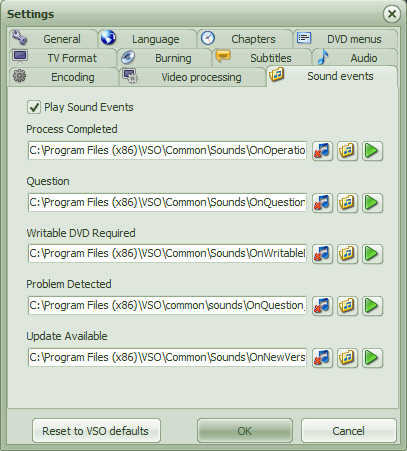 For DVD, the computer uses the Binary Value to tell the capacity of the disc. With this value, the program can surely burn a converted project, even if it has gone a little bit over target size (100%+) in case of "wrong" assumption. If you are doing other tasks at the same time on your computer you can set the priority level in which your computer will treat the conversion in order not to slow down your other tasks or to prioritize the conversion instead. Generally, it is best to run ConvertX without any background tasks going on. ConvertX encodes the video with a variable bitrate, which is best for quality, using a customized Constant Quality encoding method. This means that if a scene is "complex" (example: with fast movement), the encoder will reserve more space for this part of the video than for simple scenes (static) with less information (elements). The more/longer the video you want to put on a disk, the lower the average video bitrate must be, so it is more important to save some space during "slow" or static scenes to provide more space for "fast" action or detailed scenes. In the two pass mode, the first pass encodes the video but does not write the video to the disk, analyzing and taking notes of the video file in order to get an overview of the whole video file including specific information about scenes. The second pass has the job of doing the actual encoding. When the second pass starts to encode, it has for each frame the value of the complexity (including other information such as motion vectors, ...) determined during the first pass. So, the encoder is capable of distributing the bitrate exactly where it is required, taking the whole movie as reference. Audio encoding is done in second pass. If unticked/unchecked) then the software will use the Single pass encoding: The encoder doesn't know the complexity of the scenes because they were not yet played. So, averaging the bitrate must be done within a small portion of the video (a few seconds). Thus, it may occur that if a complex scene arrives, but to maintain the average bitrate over the slice of video considered, there is not enough bitrate available to handle the scene, thus giving artifacts. Because ConvertX uses a smart encoding process based on the Constant Quality encoding method rare will be the number of 2 pass conversions that will give better quality than simply 1 pass conversions. however, slight differences may occur especially when the encoded movie is long. The quality difference will be visible mostly when there is fast action scenes, double pass will tend to produce less square artifacts than single pass. Due to the intrinsic behavior of the FFMPEG encoder, when the average video bitrate is above 5 Mbps (quantization factor is 1 for Short project), the benefit of the two-pass tends to be smaller. However, if the bitrate is below that, then two-pass will result in more frames encoded with the smaller possible Q (smaller is better, Q=1 is better as Q=2). Also when the DVD is not filled to the specified target size, the quality difference between single pass and two-pass is minimal, so two-pass probably is not necessary. Note that the average video bitrate for Short project will always be higher than Medium and Long project, largely in part the project length is short. Video resize method: Select how videos will be resized to fill / fit the screen by default. For more info and see how the image is resized live, check out the Output Tab in the preview. Resize filters: These filters are written from scratch and possibly are similar to the existing original filters from the respective creators. Hardware decoding: Checking this option may give faster results depending on your computer and graphic card (basically if you see less than 30FPS for the encoding of titlesets then try checking this option to get faster conversion times). For a complete description of this setting please read this post. Allow more than one hardware decoder instance, if graphic card supports this function then this will allow the conversion to be completed faster, but the conversion could fail or end in an error this is all based on your video card's capacity to process this request. 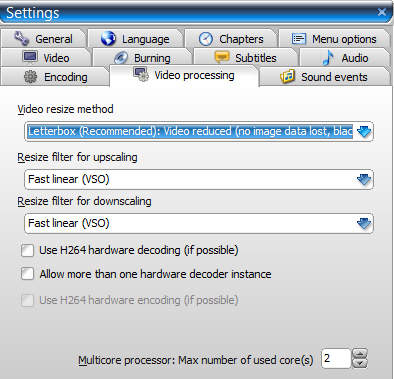 For ConvertXtoHD, hardware encoding H264 is available if your PC configuration permits it. Multicore processor support: You can set how many cores of your processor are used while running ConvertXtoDVD, while the remaining(s) is/are used for other programs. Recent microprocessors embed several cores (physical and logical). Each core can work (in theory) in parallel, independently. Multicore support is a technique that allows a task to be split up to different cores of the PC. It involving intensive CPU computation. independently), and also all the cores must be synchronized at the end of their work, which in fact consumes time. So, speed gain due to multicore support is bigger when used with high definition source content and high quality resize filters, and may even degrade performances when used with low definition source content. **De-interlacing**: This option was available in previous version ConvertXtoDVD 4, and is now gone in Version 5 which now handles this treatment automatically. Tick or untick on "Play sound events" to turn on/off the vocal indications guiding you through the software: warning in case of problem, telling you when the conversion is over, etc. If you want to disable one or more of the sounds, click on the music note icon with the red X next to the file.